Bonita 13, Garden Grove 0; Bonita 4, St. John Bosco 1 — Senior Nick Johnson pitched a no-hitter for the Bearcats in Saturday’s opener at the Anaheim Lions Tournament. Adam Guerrero went 2 for 4 with two runs and Nick Mistone went 3 for 4 with three runs for the Bearcats. 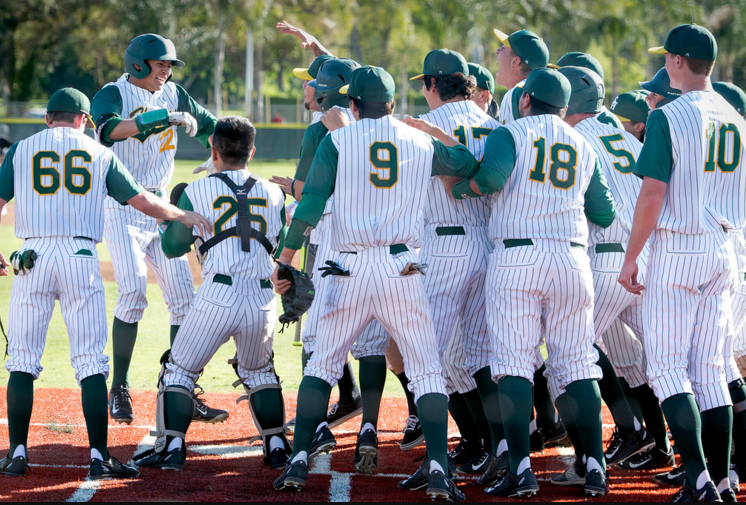 Jordan Dreschler threw a one-hitter, Guerrero went 3 for 4 with two runs and Brandon Bradshaw had two hits and two RBIs to lead Bonita (10-1, 2-1) to win the second game of the tournament. South Hills 5, Ayala 1 — Quinn Cotter hit a grand slam in the third inning for the Huskies (8-2, 3-0) in a Palomares league victory. Hayden Petrovick was the winning pitcher, improving to 5-0, Chris Moya went 2 for 3 with an RBI, Aaron Fong went 2 for 3 with a double, and Daniel Genna had a double. Glendora 15, Claremont 0 — Jake Gaudet pitched a one-hitter, striking out six, and Jacob Nemeth went 4 for 5 with a triple, double and three RBIs for the Tartans (7-4, 1-2) in a Palomares League win. Caleb Watkins went 2 for 4 with a double and three RBIs and Griffen Herrera and Bryce Wooldridge both went 2 for 3 for Glendora. Garey 11, Pomona 2 — Omar Martinez pitched a complete game for the Vikings (5-3, 3-0) in a Miramonte League game. West Covina 11, Valencia 7 — The Bulldogs (5-6, 1-1) combined 13 hits for the Lions Tournament win. Daniel Rios was the winning pitcher. Bassett 8, La Puente 7 — Frank Villanueva was the winning pitcher, striking out seven, and went 2 for 4 with an RBI and Ricky Mejia went 2 for 3 with a double for the Olympians (2-5, 1-2) in a Miramonte League victory. Monrovia 2, Temple City 1 — Isaiah Ramos pitched five innings, and had a two-run homer for the Wildcats (7-2, 2-0) in a Rio Hondo League game. Ganesha 14, Edgewood 5 — Robert Cazares pitched six innings for the Giants (6-2, 3-0) in a Miramonte League win. Edgewood 15, Ganesha 1 — Sammy Alvarado went 4 for 4 with three home runs and a double and Hailee Reinert was the winning pitcher to lead the Lions (7-1, 3-0) to the Miramonte League win. Baldwin park 14, Gladstone 1 — The Braves had 18 hits in the Montview League game. Francisco Ruiz, Jacob Robles and Freddy Quintana all had three hits for the Braves (3-3, 1-2) in the road game. Andrew Barboza had four RBIs. The Gladiators (1-4) are winless in league play. Azusa 11, Duarte 5 — Josh Rodarte was the winning pitcher for the Aztecs (6-2, 4-0) in a Montview League game. Walnut 242, Chino 326 — The Mustangs (14-2, 6-0) defeated the Cowboys in a Hacienda League match. Los Altos High School baseball coach Hector Gutierrez is no longer with the team, sources confirmed. It is not clear whether Gutierrez was fired or resigned with the team 4-4 overall and 1-1 in the early stages of Hacienda League action. Under Gutierrez last year, the Conquerors finished 12-14-1 and lost in the first round of the CIF-SS Playoffs. Gutierrez was hired in the summer of 2014 to take over for Andrew Formano, who is now the school’s athletic director. I sent an email to the principal, athletic director and athletic secretary trying to find out why he is no longer the baseball coach, but none of the school officials have reached back to explain, or announce who the interim coach is, though we’ve heard through sources it’s Sean Kane. What a strange situation. 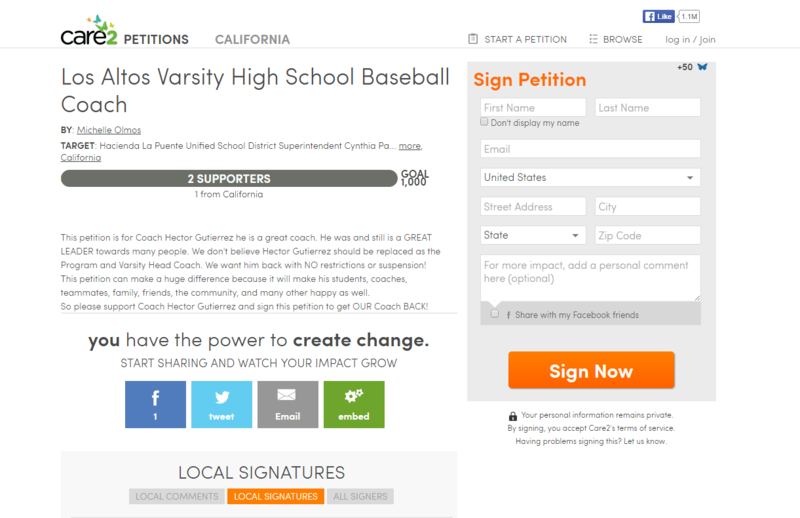 And now there is a petition floating around asking for signatures to get Gutierrez’s job back. What’s going on at L.A.? Add Diamond Ranch High School to the concerning list of area football programs without a head coach for the upcoming season. The school announced last Friday that it had parted with Jimmy Welker after just one season. The Panthers’ previous head coach, Mario Gomez, also lasted only one season. Diamond Ranch now joins Baldwin Park, Bonita, El Monte, Monrovia and Wilson in having coaching vacancies with spring practice right around the corner. The Panthers went 7-4 last season and lost to eventual Central Division champion San Marino in the first round despite giving the Titans one of the better games they had all season. Welker declined to discuss specifics of the situation, as did Diamond Ranch officials, but said he will finish out the year there as a teacher before moving on. He’s hopeful for a quick return to coaching. “It’s disappointing, but things happen for a reason,” Welker said. “I am a football coach and my goal is to coach again. I’m not hanging it up. I need to look at what’s out there. PRESS RELEASE: Charter Oak High School football players Darl Bernardino, Kamden Brown, Kyle Morales, Ryan Nguyen, and Robert Owen III were honored this week at the 46th Annual Scholar Athlete Awards banquet for the National Football Foundation at the Pasadena Convention Center. Every year the National Football Foundation honors academic and athletic excellence on school’s varsity football teams as part of the San Gabriel Valley Chapter and Pasadena areas. The criteria for the scholar athlete award includes a minimum GPA, a member of the varsity team their senior year, exhibited outstanding football achievement, and demonstrated leadership on and off campus. In addition to the five Charter Oak players aforementioned that received scholar-athlete recognition, the Tournament of Roses Scholarship presented by their President was awarded to Ryan Nguyen. The David M. Davis Scholarship award was presented to Darl Bernardino and the Coach Jim Brownfield Scholarship award was presented to Kamden Brown. In the 46th year’s banquet’s history no school has had 5 representatives and the chapter has never awarded three scholarship award winners to the same school. South Hills got solid relief pitching and a hit a pair of home runs to stay on top of the Palomares League standings with a 5-2 win over Bonita on Wednesday afternoon.Junior Karlos Morales hit a grand slam over the Green Monster in right field in the bottom of the fifth inning to give the Huskies the lead.